We have been following PopBooth for a while. It looked like a fun app for our iPads and included a nice print service. It sat in our bookmarks to watch for Apple to approve. Today, we saw the Free Universal PopBooth photo booth app apear in the iTunes store. An app that brings photo booth fun to the iPad2 and your next get together. When you launch PopBooth, you are looking at yourself on the screen via the iPad2’s camera. Only this camera is used since you need to be able to see your smiling/goofy face for the photos. 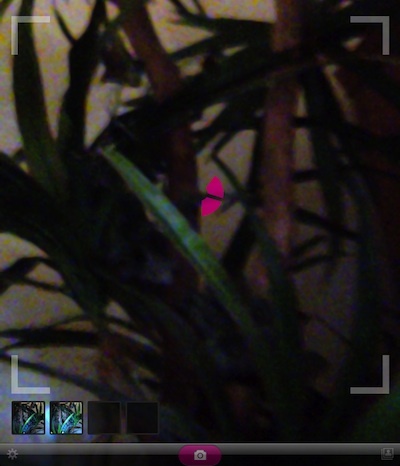 The lower left corner is the prefs area (set up and log into PopBooth services) and the center camera button starts the process of the first picture. The area of the image being taken is seen with small box corners on the screen. 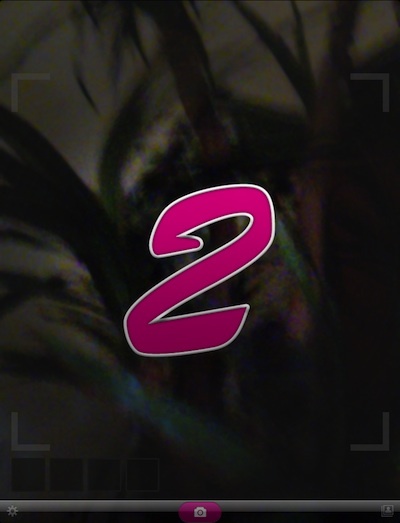 Tap the camera button to start… a countdown from 3 gives warning of the first image being taken. After the first count down and first image, a count down circle appears in the center of the screen. It counts down a couple seconds, then the next of four PopBooth images are taken until all four are done. After PopBooth has completed the process of taking four images, you can view the finished strip of pictures. You can apply four different filter effects to the strip of images if you choose, or leave exactly as they were created. This is a ‘photo booth’ experience so there is no ability to edit the images. After you choose which effect (or none) to use on the photo strip, you can have PopBooth professionally print two copies of the strip on a card and mail to you or others. The printing is currently $2.99. 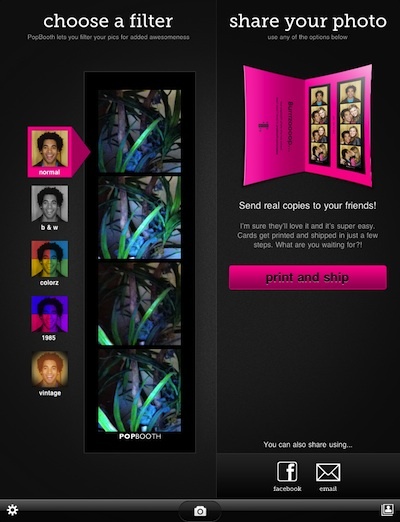 The PopBooth app also allows you to send the strip to Facebook or be emailed. All of the photo booth strips created can be accessed through the button in the lower left corner of the screen. We have yet to find a way to delete the strips from that page though. 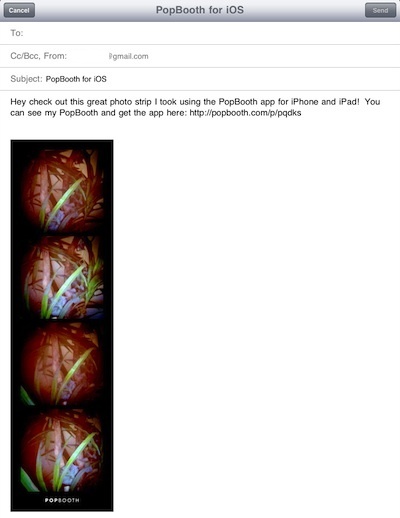 If you choose to ’email’, an email is created with the image of the four PopBooth photo booth photos to share. We left the default text in the image below, which can be edited like a regular email.